Print this list of emergency hotline numbers and keep it in a visible location. For additional information on the symptoms and treatment of specific mental health conditions, please visit our News & Publications page. When we talk about mental health, we are referring to the ways in which our feelings, thoughts, and behaviors affect our day-to-day lives. Our mental health affects the way we interact with our family, friends, work, and school. We often recognize physical signs of illness; however, being aware of our mental wellbeing is just as important to our overall health. If you had a broken arm, you would not wait to get medical attention. Likewise, the best time to begin counseling services is when you first notice the problem. A professional therapist can help you or your loved one find ways to identify the issue, cope with the situation, and alleviate the symptoms, allowing you to get on with leading a happier, more constructive life. If you need immediate assistance, The Village Life Center provides emergency services 24 hours a day, 7 days a week. Please call our emergency hotline at (225) 385-3278. If you’ve decided it’s time to ask for help but do not need emergency services, please feel free to contact us. 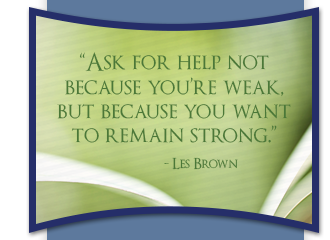 We would be happy to answer your questions, discuss our services, or schedule an appointment to see a counselor.